Fort Cedrian is a medium-sized fort between Bravil and Cheydinhal containing marauders. It contains two zones: Fort Cedrian and Fort Cedrian Mausoleum. With the addition of the Spell Tomes official plug-in, a single non-respawning conjurer (carrying a single random spell tome) appears near the entrance of the fort. However, he will track down the player and therefore typically is encountered by the player elsewhere in Cyrodiil. A guaranteed magic item, the Royal Cuirass, can be found in Fort Cedrian Mausoleum. 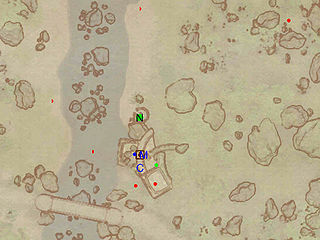 This location's map marker (M on map) is named Fort Cedrian (editor name FortCedrianMapMarker). The entrance door is E of the marker, 10 feet away. One conjurer added by the Spell Tomes plug-in spawns near the entrance. Upon entering, ignore the corridors to your right and left, and proceed straight ahead. 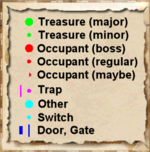 Take care to avoid the pressure plate (E) which activates the two Swinging Mace traps at F. The next room contains two Marauders, two bedrolls (b) and two minor loot chests. Head north and follow a winding corridor, passing by a Marauder and the remains of a skeleton clutching an iron dagger. The next room has a tomb-like aspect and knee-deep water. 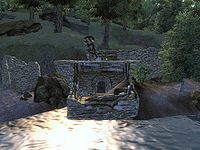 Wade through it to defeat two Marauders guarding two minor loot chests and a Nirnroot at N. The gate at G has a Very Hard lock on it, but you are rewarded with a minor loot chest, an iron shield and a fine iron shortsword if you can pick it. 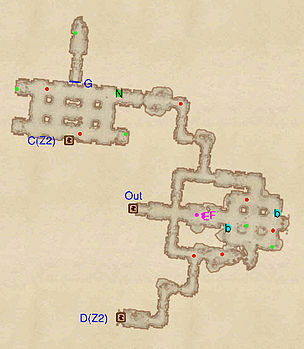 Head over to the second zone through door C.
On your way back from the Mausoleum, you'll come through door D. On the way back out, you'll face two rats and come across the remains of two skeletons, clutching an iron dagger and iron war axe respectively. 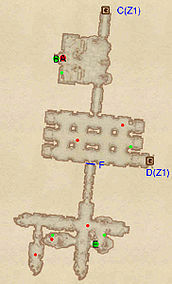 Entering from door C, you will immediately the boss-level Marauder (A) guarding the boss chest (B) and a minor loot chest. There is a fine steel dagger on a ledge next to the left-hand set of stairs. The next room contains two Marauders and another minor loot chest. The gate at F has a Very Hard lock but is well worth the effort to pick it. You will quickly be underwater, so water breathing is recommended. Dispatch the slaughterfish in front of you and head to the left: a minor loot chest, an iron dagger and 3 iron arrows are nearby. In the western corridor, a slaughterfish guards a fine steel warhammer. Once you've retrieved it, head south and swim down the hole in the floor. The room below contains a slaughterfish, a minor loot chest and the enchanted Royal Cuirass (E). Swim back out and return to the previous zone through door D.
1 Royal Cuirass at E.